I am dedicated to black-and-white photography. 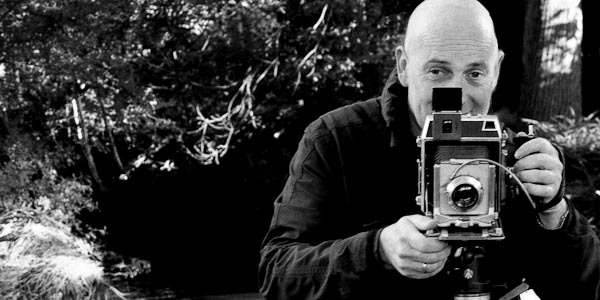 After years of working in commercial photography, I directed my interests to black-and-white artistic photography. I find my inspiration in the problems of multicultural societies, the coexistence of various national and ethnic groups, the issues of a language barrier, as well as in the lack of dialogue between the "old" (the native population) and the "new" (the immigrants). Furthermore, I am very interested in classic arts, and I am seeking to make a bridge between these arts - let’s say from Altamira to Picasso - and temporary arts with modern techniques. A photo can break the silence. To illustrate contemporary social issues in a funny way, I developed a series of quotes and sayings, which are illustrated by children and adults from different cultures, and who are saying the words in sign language. The result was a series that was unique in the world. 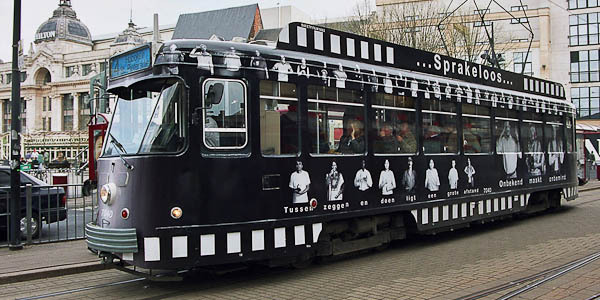 To expose my art, I use several media outlets - the classic (like printed media) and also trams and airplanes. Furthermore, I also pursue commercial assignments, but I always specialize in black-and-white - in calendars, exhibition booths, book covers and illustrations. Queen Paola has visited a photoshoot of mine. Besides my social artistic work, I work commercially. I do different kinds of commercial work - creating calendars, advertisements, catalogues, book covers, artist books, billboards and so on. However, always based on my fine art work. In the following, you can see how I exhibit my work. It is not always presented in a traditional way, like an exhibition, but rather in public places, like an airport, on a plane and so on. 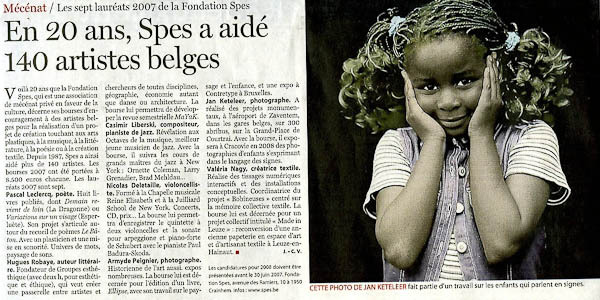 In 2007, I won the international art contest, "the SPES award". This international contest hands out an award every year for the best artist in his/her field. I'm very proud that I won in 2007 in the visual arts category. My work is featured in the permanent art collection of Brussels Airport. 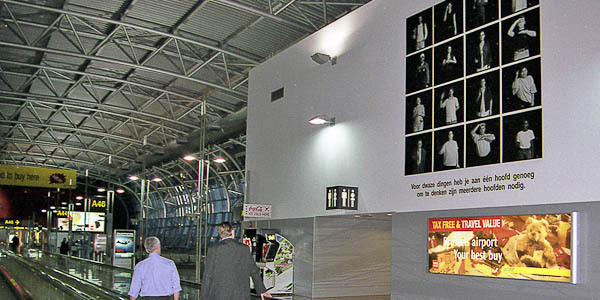 In 2005, one of my pieces was chosen to be part of the art collection of Brussels Airport. Every 4 -5 years, it will be placed in another location at the airport. Since 2001, the BIAC (Brussels International Airport Company, now Brussels Airport Company) created a foundation called Artport. This foundation looks after the acquisition, management, promotion and maintenance of works at the airport. Currently, more than 200 works are exhibited by various artists. Each were commissioned to design an art piece to the theme of aviation and travel. 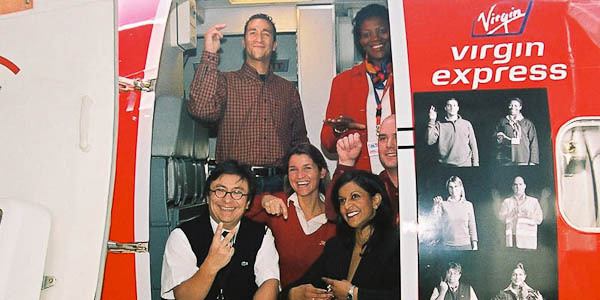 The Boeing 737 with the models who posed for it. My pictures can be seen on a Boeing 737. 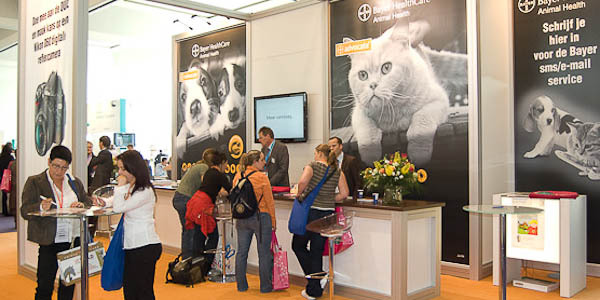 Why always put your pictures in an exhibition or publish them in a magazine? You have to do something different - put them on a plane, for example. You can think this. Nobody will see them. Wrong. I've put the picture next to the entrance - big enough that everybody has to see it when entering the plane. This Boeing, from Virgin, has more than 200,000 passengers between two maintenances; during a big maintenance, all the paint on the plane has to be stripped - as does the picture). 200,000 viewers. I think that is enough. The traditional way to get your work across is the exhibition. I have exhibited my work nationally and internationally. How many - honestly I don't know anymore. For example, my project “Roots with Taboo” has exhibited more than 20 times and is still running. “Speechless” is currently making an international tour. 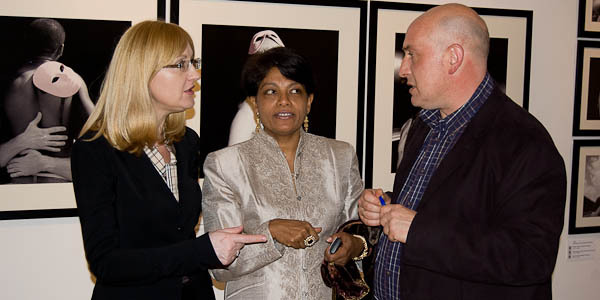 At my exhibition in Krakow. This entry was posted on Saturday, August 26th, 2017 at 9:17 am. It is filed under Fine Art, Members, Stories. You can follow any responses to this entry through the RSS 2.0 feed.